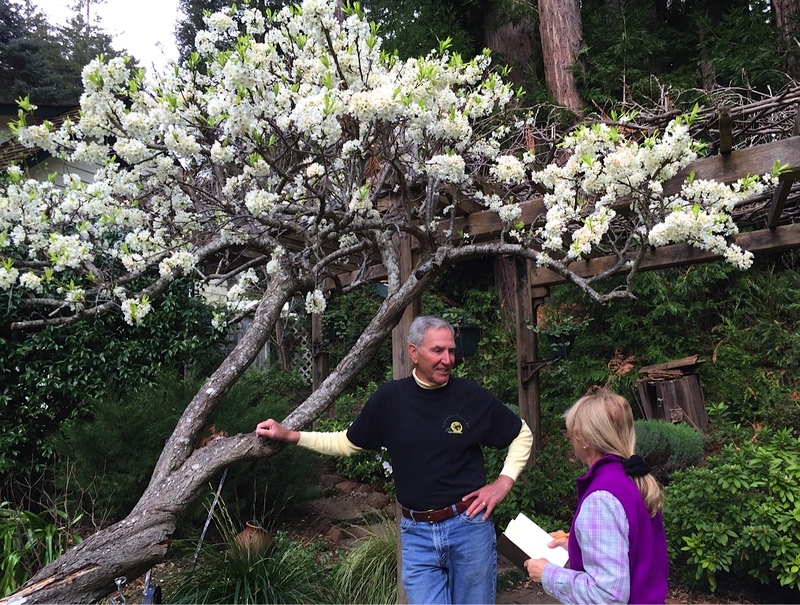 Robert Stoll joined Santa Cruz Bonsai Kai in 1989 two months after it started. He and I have something in common. 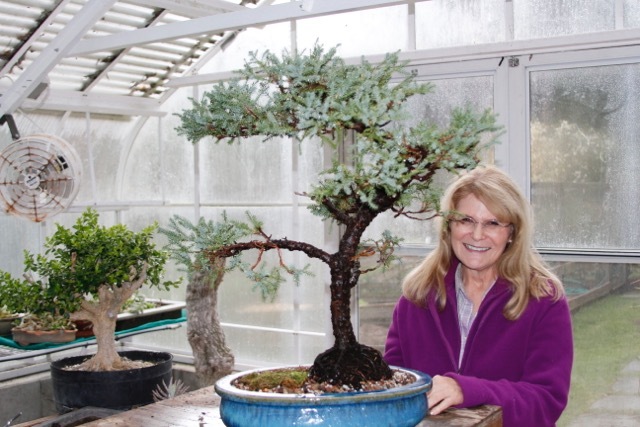 We both have won a bonsai specimen that remains one of our favorites. His will be featured at the club’s upcoming bonsai exhibit while mine lives a quietly on my patio. Robert Stoll at his work bench explaining bonsai techniques. Recently I spent some time in the garden of this knowledgeable man while he shared stories of the history of bonsai and what the art means to him. Robert will be displaying three specimens at the show this year- the juniper chinensis procumbens ’Nana’ he has been training since he won it 20 years ago, another ‘Nana’ specimen and a pfitzer juniper that can be traced back to 1901. He dug it up 15 years ago and has been training it ever since. The word bonsai comes from two Japanese words that provide the most basic definition of this living art form. “Bon” means tray or pot, while “sai” means to plant. One of the reasons we all admire bonsai is how old they look -appearing to be veterans of years of struggle against natural forces. Some are actually hundreds of years old and handed down in families while others look very old utilizing techniques help further this illusion. There is a technique called jin which causes weathered-looking dieback on a branch and is created by stripping a branch of bark. In nature, deadwood is created when a tree is hit by lightning, exposed to sustained periods of drought or when branches snap due to ice stress, wind or weight of snow. The wood dies off and is bleached by intense sunlight. Robert has many examples of this technique. As living things, bonsai are always growing, leaves and stems being pinched, branches wired into natural looking shapes, the trunks thickening and sometimes developing nebari, that most sought-after look when the surface roots of the tree or root flare are visible above the growing medium. Be inspired and have all your questions answered about growing bonsai from the experts. Don’t miss the upcoming 30h Annual Santa Cruz Bonsai Kai exhibit Saturday and Sunday, April 14 & 15 at the Museum of Art and History at 705 Front Street in Santa Cruz from 10:00am – 5:00pm each day. Entry fee is $5 per person which includes the museum. Kids 12 and under get in free so it’s a great way to spend the day. Saturday activities include a performance by the Watsonville Taiko, Japanese flower arranging, origami demonstrations and Sumi-e ink painting. On Sunday the Santa Cruz Todo Kai will be performing. There will be a shamisen musical instrument performance and the origami and Semi-e ink demonstrations will be ongoing throughout the day. Every plant sold or raffled at the show comes with an invitation to the monthly Santa Cruz Bonsai Kai club meetings where new enthusiasts are welcomed and nurtured. Besides taking in the beautiful bonsai on display you can purchase finished bonsai and starter plants as well as get experienced help with trees purchased. There will be door prizes and refreshments. You might even win the raffle for the demonstration specimen created each day at 2:00 pm by Bonsai Artist Jonas Dupuich on Saturday or if you come to the show on Sunday the one created by Sensei Katsumi Kinoshita. Once Upon a Time in a place not so far away a group of kids gathered to learn about the art of bonsai. This group of home-schooled kids gather weekly at the old Redwood Elementary School in Boulder Creek on “outdoor day” to hike, craft and learn about nature. On this day, after returning from a morning hike, everyone was ready to get started creating their own bonsai. With the 29th Annual Exhibit of Santa Cruz Bonsai Kai club fast approaching on Saturday and Sunday April 8th & 9th at the Museum of Art & History in Santa Cruz, there was no time to lose and most of the kids wanted their newly created bonsai to be included in the show. 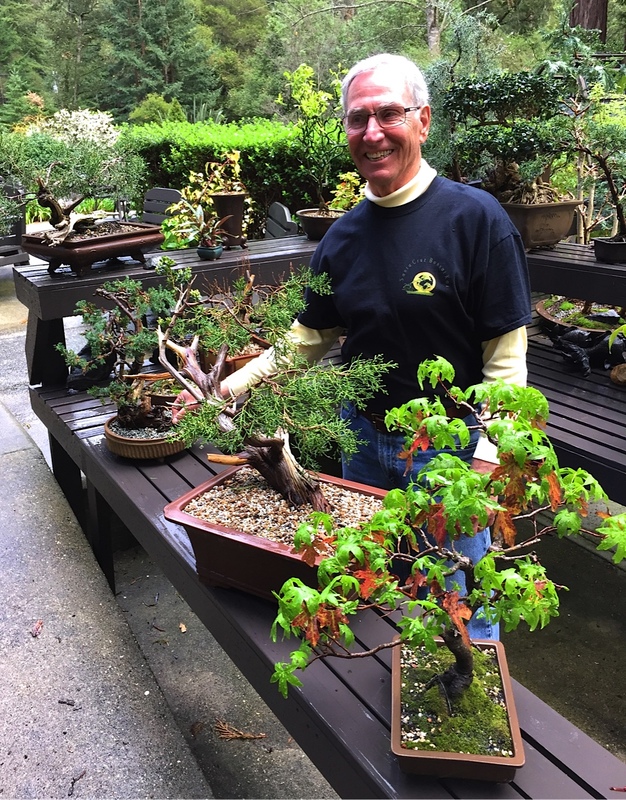 Former president of the Santa Cruz Bonsai Kai, Chris Howe, has been a long time bonsai aficionado dating back to the days when we used to work together at a local nursery. His daughter Gloria is in this class along with 12 of her 3rd to 5th grade classmates. Chris had an attentive audience as he related a short history of bonsai and gave a few tips for the kids to get started styling their own dwarf Japanese garden junipers. With this advice the kids got started on their one gallon junipers. All the plants and pots were donated for the class by the Santa Cruz Bonsai Kai club. Each child also received a free bonsai coloring book showing the different styles and techniques which was also donated to the class by the club. The word bonsai comes from two Japanese words that provide the most basic definition of this living art form. “Bon” means tray or pot, while “sai” means to plant. One of the reasons we all admire bonsai is how old they look -appearing to be veterans of years of struggle against natural forces. Some are actually hundreds of years old and handed down in families while others just look very old and some techniques help further this illusion. There is a technique called Jin which causes weathered-looking dieback on a branch and is created by stripping a branch of bark. When asked by Chris nearly all the kids wanted to have a branch tip or two crushed by pliers so they could peal off the bark. In nature, deadwood is created when a tree is hit by lightning, exposed to sustained periods of drought or when branches snap due to ice stress, wind or weight of snow. The wood dies off and is bleached by intense sunlight. Gloria with her finished bonsai and others from classmates. As living things, bonsai are always growing, leaves and stems being pinched, the branches wired into natural looking shapes, the trunks thickening. Chris showed the class one of his prized bonsai specimens and explained which techniques he used to style it. Don’t miss the upcoming 29h Annual Santa Cruz Bonsai Kai show Saturday and Sunday, April 8th & 9th at the Museum of Art and History at 705 Front Street in Santa Cruz from 10am -5pm each day. Entry fee is $5 per person to the museum and the show. Kids 12 and under get in free so it’s a great way to spend the day. Besides taking in the beautiful bonsai on display you can purchase finished bonsai and starter plants as well as get experienced help with trees purchased. There will be door prizes and refreshments. You might even win the raffle for the demonstration specimen created each day at 2:00 pm by Bonsai Master, Eric Shrader on Saturday or if you come to the show on Sunday created by Sensei Katsumi Kinoshita. Driving up Love Creek in Ben Lomond it’s hard to imagine the magnitude of the famous slide in 1982 that caused such devastation and loss of life. The ferns are lush now bordering the creek which flows to the San Lorenzo river. I’m on my way to visit an old friend, Chris Howe who is getting his bonsai collection ready for the Santa Cruz Bonsai Kai Club’s 28th Annual show coming up on the first weekend of April. We used to work together at a local nursery and I’m looking forward to seeing his plants. Chris first became interested in the art of bonsai about 15 years ago. Working in a nursery he could see the potential of overlooked, overgrown specimens with interesting trunks begging to to be styled into trees that look much older than their size suggests. To further his knowledge of this ancient craft he joined the Santa Cruz Bonsai Kai Club and was their president for four years. Chris lives with his family, two dogs and some chickens on 14 acres so there is plenty of space to shelter his prized bonsai specimens as well as those in early training or waiting to attain that most sought after illusion of age. “They’re never finished”, Chris laughed. He says his kids, Gloria, Ruby and Frederick, all show some interest in his hobby although the youngest is more apt to toss the ornamental rocks around than marvel at how old the bonsai look. Among his collection, Chris has an impressive Liquidambar orientalis he is hoping to enter into the show this year. Slow growing and native to the eastern Mediterranean regions of Turkey and the Greek island of Rhodes where large stands still grow, Chris methodically pinched every large leaf leaving the smaller ones. This technique will cause the tree to eventually produce only small leaves making the tree look older. As living things, bonsai are always growing, leaves and stems being pinched, the branches wired into natural looking shapes, the trunks thickening and sometimes developing nebari or that most sought after look when the surface roots of the tree or root flare are visible above the growing medium. Included in Chris’s collection are a dramatic California buckeye, many Japanese maple, Chinese elm, ilex crenata and a tilia which is called a lime tree in the British Isles. He found the tilia many years ago thrown in some bushes behind an apartment complex in Santa Cruz. Chris speculates that the original owner bought the tilia as a finished bonsai but thought it was dead as it’s deciduous. You can never tell where a good bonsai will originate. All the members of the club are busy getting ready for their annual show. Each decides which of their specimens they will offer for sale, contribute to the raffle or to enter into the show. Moss needs to be collected and placed over the soil and around the rocks in the pot, the correct base chosen to complement each specimen, training wires removed, pots cleaned and polished. Some members have styled and trained one of 20 small junipers the club bought last fall to sell in the raffle as a fundraiser. I thought Chris’s specimen turned out especially well and hope I’m the one who wins it at the upcoming show. Don’t miss the upcoming 28th Annual Santa Cruz Bonsai Kai show Saturday, April 2nd and Sunday, April 3rd at the Museum of Art and History at 705 Front Street in Santa Cruz from 10am -5pm each day. Entry fee is $5 per person to the museum and the show. Be inspired and have all your questions answered about growing bonsai from the experts. At 2:00 pm both days there will be a demonstration by the bonsai artist, Mike Pistello (Saturday )and bonsai sensei, Katsumi Kinoshita (Sunday). In the demonstrations, each will show where and how much to trim an ordinary piece of plant material, how to wire the branches to set their growth in the desired shape and how to pot the tree. The completed bonsai will be raffled afterwards. Come and enjoy an amazing exhibit of bonsai. For sale will be finished bonsai, pre-bonsai trees, pots and more. Door prizes, special entertainment and complimentary tea and cookies will be available as well as free advice from experienced members. It all started several years ago at the annual bonsai show presented by the Santa Cruz Bonsai Kai Club. I was sitting in the front row watching the sensei (meaning teacher) finish styling an overgrown 5 gallon juniper into a breathtaking specimen. It was truly impressive with the branches suggesting a tree growing on a windswept hill. The raffle started which is one of the main fund raisers for the club. Of the many prizes offered the large specimen created by the sensei is the the most coveted. I sat and sat and sat as dozens of numbers other than mine were called and eager winners walked away with smaller finished bonsai, starter plants, pots and tools. But then the last number was drawn with much fanfare as this was for the giant creation. I heard my number. I was beside overjoyed not only because I never win anything but because this prize was so exquisite. Fast forward to the present. With the 27th Annual Bonsai Show coming up I knew I would be asked how my specimen was doing. I hate to admit but I hadn’t repotted it as I should have and how do I prune the darn thing? So I sought out an expert in the Santa Cruz Bonsai Kai club to help me. Although it’s not difficult repotting a bonsai is quite different than repotting an ornamental shrub on your patio. I didn’t want to mess up. Fellow Bonny Dooner and longtime member of the club, Ed Lambing was more than happy to show me his collection and help me with the repotting of my juniper. He even shared with me his recipe for the mix he uses which is usually a highly guarded secret by bonsai enthusiasts-on the same scale with “if I told you I’d have to kill you”. Ed and Nancy Lambing have created a beautifully landscaped garden that just keeps getting better with time. From the koi pond to the naturalistic rock swimming pool to the wisteria pergola everything looks like it has always been just so. At every turn Ed has displayed his larger bonsai on tree trunks and flat rocks. He also has a greenhouse for repotting and nurturing cuttings, a bonsai nursery where specimens are in training and a bonsai display area for his prized specimens that gets the best morning sun and afternoon shade. The word bonsai comes from two Japanese words that provide the most basic definition of the living art form. “Bon” means tray or pot while “sai” means to plant. Ed’s interest in this art form first started 30 years ago. He now has more bonsai than I could count. He has a California juniper bonsai that is estimated to be 400 years old based on It’s trunk diameter. It takes 100 years for this plant to grow 3/4” trunk thickness. Other trees in his collection include several very old and gnarled olive trees, citrus, shefflera, maples and elms to name just a few. Back in the greenhouse we started to repot my juniper. Ed wired some small branches to create a more wind-blown look, eased my root-bound dwarf Japanese garden juniper from it’s pot and proceeded to tease the roots. Other steps ranged from wiring screen over the holes in the bottom of the pot to root pruning 2/3 of the root hairs- yikes- and then placing the trunk over gravel at the side of the new pot to mimic the effects of wind on the tree. Ed advised me that my tree was a good prospect for a root over rock or “Sekijoju” specimen in the future. I’ll need to find just the right rock for the upper roots to grip and look like they were exposed by erosion over a period of time. After wiring the top heavy juniper into the pot. Ed added his special bonsai potting mix and then used a chopstick to wiggle the mix down into the root ball to eliminate air pockets and compact the mix over the entire pot. Bonsai in America has thankfully evolved into it’s own style. I love the look o f the glazed pot I used when repotting my tree but traditional Japanese style would have used a plain unglazed one. 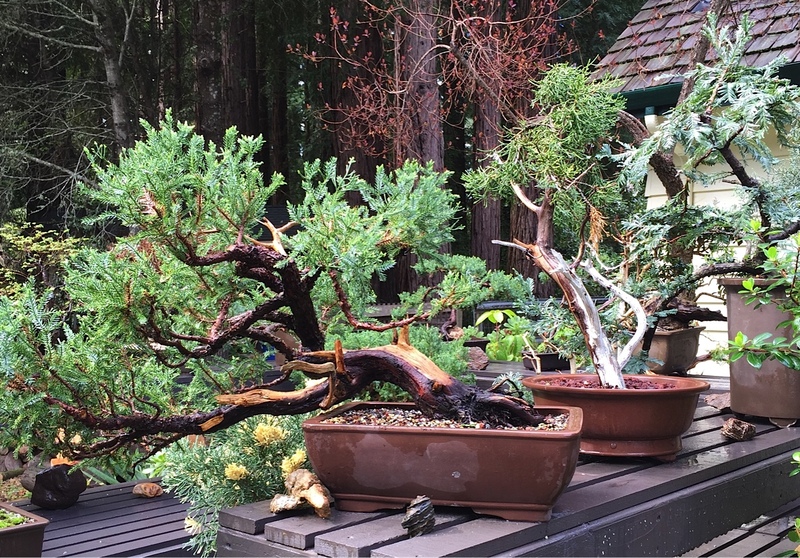 All the members of the Santa Cruz Bonsai Kai club are busy getting ready for their annual show. Each decides which of their specimens will be entered in the show, offered for sale or contributed to the raffle. Moss needs to be collected, the correct base chosen to complement each specimen, training wires removed, pots cleaned and polished. Ed has a 20 year old Japanese Maple that he plans to show. It started life before he got it as a 5 gallon plant and has been in training ever since. Unfortunately, a beautiful wisteria which was just starting to bloom at the time of my visit will be mostly finished by the time of the annual bonsai show so won’t be there. One of the reasons we all admire bonsai is how old they look. While some are actually hundreds of years old and handed down in families others just look very old and some techniques help further this allusion. 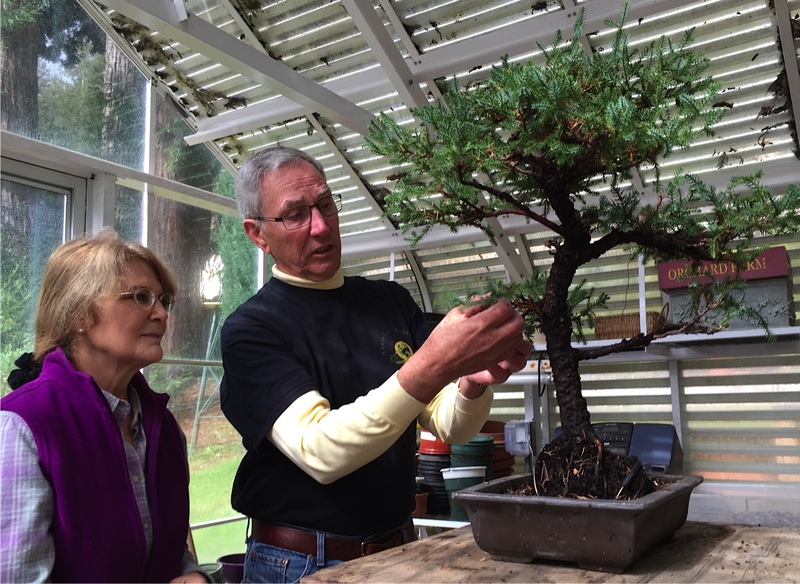 Ed plans to show another California Juniper, this one 200 yrs old and originally styled by famed bonsai sensei “Mr California Juniper”, Harry Hirao. Using the “Jin” technique it has the illusion of even more age due to the weathered dieback of some branches. Every plant sold or raffled at the show comes with an invitation to the monthly Santa Cruz Bonsai Kai club meetings where new enthusiasts are welcomed and nurtured. 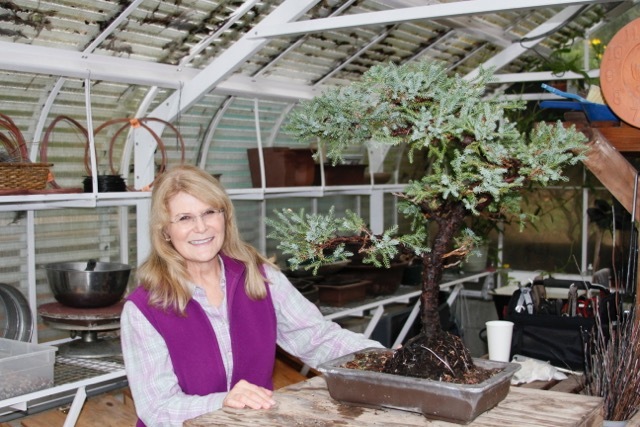 You can find out more by attending the 27th Annual Bonsai Show which takes place from 10:00 am to 5:00 pm on both Saturday, March 28th and Sunday, March 29th at the Museum of Art and History at 705 Front Street in Santa Cruz. Entry fee is $5 per person for the Bonsai Show and Museum. Besides taking in the beautiful bonsai on display you can purchase breathtaking finished bonsai and starter plants as well as get experienced help with trees purchased. There will be door prizes and refreshments. You might even win the raffle for the demonstration specimen created each day at 2:00 pm by Bonsai Artist, Mike Pistello.